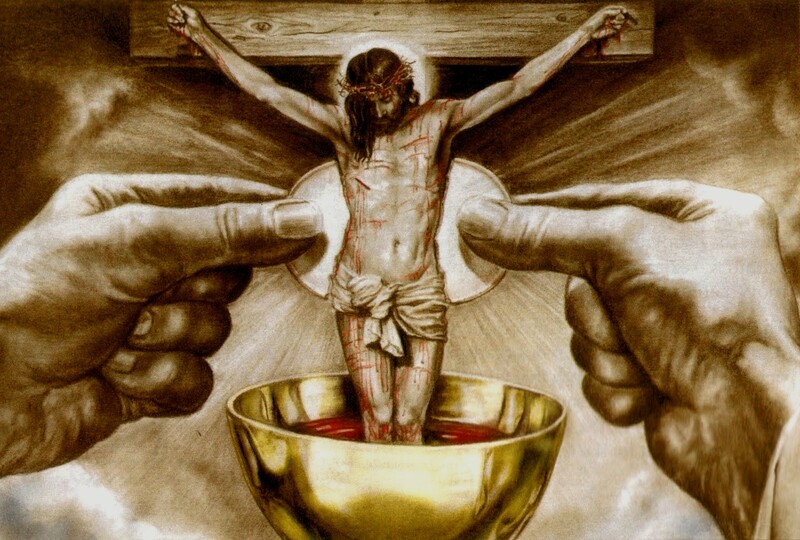 “Is the Holy Eucharist Really Jesus' Body and Blood?" Faithful Catholics come to this holy place every week to celebrate and recall the Betrothal event of Calvary, which began with a Supper and ended with the consummating and sacrificial love of Jesus, the Bridegroom, once and for all on the Cross. The holy hour we spend at Mass is time we set apart from all other time so that we may become what we receive, the Eucharist. Both time and space are set apart for a specific action and for a specific purpose, the Eucharist. We then become set apart and unite our worship with the Eternal Banquet which Christ promises to those who “eat His Flesh and drink His Blood” (John 6:53). In order to hear what God is communicating to us in the intimate reception of Holy Communion, like a bridegroom whispering sentiments of love to his bride, we have to allow for silence. Do you come to Mass to fulfill an obligation? Hopefully not! We do not celebrate Mass to fulfill an obligation but rather to have an encounter with the Resurrected Christ—as did Mary Magdalene, Peter, Thomas, the men on the road to Emmaus, and many others. We can be sure that all, with the exception of the Blessed Virgin Mary, had sinful lives prior to experiencing the mysterious presence of Jesus in His Glorious Resurrection. Hopefully, we attend Mass with the same burning desire as Mary Magdalene had when she ran to the Open Tomb of Christ, or when Peter and John raced each other to the Open Tomb of Christ! Running to Mass on Sundays and Holy Days is not just an obligation; rather, we run to Mass, the Open Tomb of Christ, because it is our duty and our salvation to experience the Resurrected Christ in His Flesh and Blood, the Eucharist! Does it surprise you that so few of Our Lord’s disciples actually went to the Open Tomb of Christ? Would it surprise you to know that roughly 30% of the 69.5 million Roman Catholics living in the United States believe in the True Presence of Jesus in the Holy Eucharist? At St. Therese Carmelite School, 30% would get you a big, fat "F"! We are FAILING to live out what Christ expects from His disciples when we do not attend Mass on Sundays and Holy Days. However, 70% of doubters seems consistent with the majority who walked away from Our Lord during the “Bread of Life Discourse” (John 6:22-59), the few who stood at the Cross of our Lord’s Crucifixion (Matthew 27:32), and the few who ran to the Open Tomb of Christ (John 20:1-18). While 2,000 years have passed and many claim to be Christian, it seems too few Catholics have the burning desire to run to Mass (the Open Tomb of Christ) to experience the Resurrection in the Eucharist. It would seem that 70% of our Lord’s “friends” are too busy or too bored to follow His instruction: “Do this in remembrance of Me” (1 Corinthians 11:24); (Luke 22:19). His words spoken to the Apostles should shake us to the core: “Will you leave also?” (John 6:67). Mass is the holy event which requires us to check our degrees at the door, to turn off the world, and to humbly and sincerely surrender to God’s Love. We must realize that the Eucharist elevates us beyond what is popular reasoning and beyond our own limited ability to comprehend the Presence of Jesus in the Eucharist. In order to receive the physical presence of Our Lord in the Eucharist, we must first run to the Open Tomb of Christ every Sunday—or every day if you can!—and then humbly pray the words of St. Thomas, the Doubting Apostle, “My Lord and my God!” (John 20:28). God’s unselfish Love is victorious! Death has NO power over this Love. This Love is communicated at every Mass in the whispering words of the Bridegroom at Consecration: “This is My Body”. . . “This is My Blood” (Luke 22:15-20). This Love is offered in the joyful Resurrection of Jesus the Bridegroom and must be humbly received by His faithful Bride, the Church. Thus, Jesus Christ in the Eucharist sets us apart, allowing us to become what we consume, to become holy because “the Lord God is holy” (Leviticus19:1). What is your response? Are you one of the 30% who run to the Open Tomb of Christ every Sunday to encounter the Resurrected Lord in the Eucharist? Or are you part of the 70% who are perhaps too busy or too bored? where the Lord was placed” (Matthew 28:6).